I haven't really looked into personalizing my Google homepage. But there's one personalization I would really like to be able to add : the English to Portuguese translation box from the language tools. It should be easy, but it's not obvious how I might do this. Or how to find documentation for writing third-party modules. Still, it's clear as I browse the increasing catalogue that the customized Google home is evolving into another platform. There are clocks and games and RSS feeds etc. And maybe something useful at some point. Matt from 37 Signals : Yahoo vs. Google: An academics vs. in-the-trenches entrepreneurs showdown? What did del.icio.us do right that, say, Blink did wrong? Ari Paparo, Blink cofounder, explains. Very nice post. This is a watershed moment, I think. Python is a language Apple enthusiastically endorses for building Cocoa apps, while Java is emphatically not. Wow. some Internet titans are not only growing their API portfolios by leaps and bounds, but using the word "platform" to describe the portfolios. While those short-tail platforms will undoubtedly be very compelling to developers, I wouldn't rule out some excitement in the long-tail of APIs. Harkening back to the 80's, some of the best stuff (including uber, cross-"platform" APIs) will come not from the multi-million dollar labs in Silcon Valley or China, but from someone's garage. There is some great disruption ahead of us. No one should be resting on their laurels. Compared to what we're used to, this rapid proliferation of easily accessible APIs is so, uh, so uncomputer-like. Whether or not those new APIs get used is a different story. But the point is that there's no roundtable of Jedi Knights through which all proposed kernel changes must pass. And, much the same way new mashups keep showing up every day, so too, as TechCrunch editor Mike Arrington constantly reports, do the APIs (Arrington is demonstrating a knack for getting the scoop on new APIs, blogging about them almost as soon as they become available). Still not convinced of the uncomputer? Well, then consider this: not only is anybody free to add a new API at anytime, the primary user interface — a browser — almost never needs updating to take advantage of those new APIs. Pretty uncomputer-like. Compare that to what happens when a classic operating system takes on new APIs. The upgrade cycle can be incredibly painful, requiring all sorts of special hardware, new software and budget exercises that, years from now, when millions of mashed-up applications are available to anybody — regardless of what technology they have in front of them — there will be a lot of people looking back at the old way of doing things saying "What in the world were we thinking? Why didn't we do this sooner?" Bruce Eckels looks at the shift of enthusiasm from Java to Ruby. Java advocates running scared and Heinmeier Hansson crowing. One method is parasitic. Where the services promote the development of new services that run outside of the core offering. The second is participatory. Where the services promote the development of new capabilities within the core offering (enhancing it). A final type is symbiotic. Where multiple platforms leverage each other to create a combinatorial platform. Each platform leverages the services of the other to enhance themselves. Many of the big platform wannabes are complicit in selling out free-speech to curry favour with the Chinese and other represive governments. The three players all benefit when the transaction happens. Some money to the channel, some to the maker, some “consumer surplus” left for the buyer. Pretty much, only one of these three has pricing power. The emerging hubs; they are the new Telecom, Media, and Platform companies. In the long run it, certainly looks to me like, they will be bigger and fewer. Google, which prides itself on the purity of its search results, agreed to give favored placement to content from AOL throughout its site, something it has never done before. John Robb is looking for the "go to guy" of platform war strategy. According to interview with Dan Bricklin, Microsoft's Alan Yates says "competition between standards we believe is a very good thing. Ah ... this looks interesting. What I've been asking for is Google's own language tools English to Portuguese and Portuguese to English translation boxes on my Google homepage. I wonder if this makes it possible. This series looks like it's going to be worth following. _If_ I am a decent programmer, I could use spider technology myself and would not need to use such a system. If I am a crappy programmer, at least it will be very expensive to build crappy code. But if I am no programmer at all and I want to use this system, I would not only have to pay Amazon but also a programmer to fulfill the ideas I might have. Amazon just became the first internet giant to open up their search engine index as a platform for others to build applications on. Remember, Google's book search undermines the book publishing industry (and indirectly Amazon). This is Amazon's counter-offensive. In practice, how different is this from the APIs of Google and Yahoo that things like RollYo are built on? That will run out too, because we're in an age of disintermediation. What's under attack is much bigger than newspapers, it's all forms of aggregation. Aggregation can now be customized, and it can be done by machine. So the advertisers are running away from newsprint and to online ads, to reach Scott's kids, but I believe that long before his kids come of age (they're in elementary school now), the advertisers will have run on beyond what we can see now. Once we've disintermediated the San Francisco Chronicle and NY Times (unlike Scott, I don't think any news organization is going to escape) the next target is AdSense. No need for a middle-man there either. Somehow I managed to waste half an hour ranting about disruptive innovations on this guy's blog. With a disruptive innovation, the incumbent can't get into it due to the structure of the market and their existing business model. Their existing customers DON'T NEED OR WANT the innovation. What makes MP3 disruptive to the music industry is not that it creates a new market. But that the existing industry, predicated on restricting access to only those who pay, can't figure out a way to embrace it without losing their control. Blogger didn't disrupt the blogging world. It was simply an early entrant. Google could buy it because it wasn't a threat. Blogs *are* disruptive. To the mainstream media, whose business model is adding value through investigative reporting, fact checking, mass audience and big advertising deals. Blogs with low quality control and infinitesimal audiences (individually) were not something mainstream media knew how to embrace. Their advertising buyers weren't interested. Newspaper buyers might be interested in reading but not paying. Google disrupted the online advertising market by figuring out how to sell adverts that big advertising buyers didn't want to buy (little text things that didn't attract attention to themselves), and putting them on sites (like low traffic blogs) that no-one in their right mind would imagine selling adverts on. Disruptive technologies are often examples of something worse but better. Worse on the price/performance scale that the existing customers value; but able to bring new people into the market. But it's definitely not about *merely* creating a new market. There are dozens of other new ideas which are creating new markets, which are convenient, easy and cheap; and yet don't disrupt anyone, because the moment they appear above the radar, the incumbents move in and buy them or successfully copy them. Personally, I don't see the iPod as disruptive. (Not all roaring successes are disruptive.) Well designed, fashionable, good features, sure. But who was the incumbent that was disrupted? In fact, the only incumbent who could arguably be seen to be disrupted by iPod was Sony. And that was because iPod supported MP3 while Sony, conflicted by also being a music publisher, wouldn't. Sometimes, it does just look like Yahoo are going for the publicity. Snapping up or doing deals with every cool, "web 2.0" company in order to generate good publicity and good will among the geekset. Dave notes that Yahoo are not committed exclusively to MT. They'll offer WordPress too. But it's a boost for Six Apart, who've stopped generating so much excitement recently. Or you could look at it as Yahoo buying the ongoing search/classification services of 300,000 geeks for maybe $10-$100 per geek. Steve Case argues that the AOL-TimeWarner merger produced nothing useful. Here's how AOL could become relevant again. Today, thinking about user contributed content remined me of one of the early classics : the Really Big Button that doesn't actually do anything. As someone who's not a user of del.icio.us or any other social bookmarking service, it's a little hard for me to understand exactly what the real excitement is here. Yahoo analytics : "The most popular tags / bookmarks from people who clicked on your advert are ..."
PowerPoint is probably the most widely installed "outliner" even if not used that way. So why not a way to plug it in the new OPML platform? Why don't the media "get it"? I mean, it's the end of 2005. Isn't it intuitive and obvious how the media industry could utilize Wikipedia, blogs, and podcasts (etc) to revolutionize their strategies and business models? Clearly it ought to be. But isn't. Why? Lack of creativity? Lack of any business model from the perspective of the media companies? I'd (charitably) assume the second. Although, it's so cheap to dabble with this stuff that media companies ought to be able to afford to do some experiments. Create a whole farm of wikis on your own site for your readers. Don't try to do news or editorial in these, but create wiki-like catalogues about less controversial subjects : eg. description of local bands if you're a city; about gardening or wine or fashion if you're a lifestyle sort of paper; about soap opera characters if that's the kind of rag you are. A wiki-like place for readers to suggest stories and give leads on things that should be investigated and written about. Train reporters to use wiki-like personal organizers so they can more easily keep track of the context of what they're writing about. And the above are just wiki-related ideas. There are even more things you can do with blogs, RSS, podcasts, OPML, attention etc. Not to mention the cross-overs between them. Who is going to win the triple play? It doesn't matter. Who is going to win the game? Any player with deep pockets and no particular technological dependency. At this point that could be Yahoo or Microsoft or AOL or some new player altogether, but it probably means Google. Update : actually, read the previous story first. Tim Bray has an interesting point. Having spent some time looking at what GUI library to use for my current Python project and seeing things haven't developed very much in the last five years in terms of standards and resources, I think the JVM / Java platform is in a strong position. Swing isn't wonderful but, as Bray notes, neither is the competition. - a XUL or XUML on top of the Java platform. - open sourcing the JVM. Strategically this must be worthwhile for Sun now. It's not like Microsoft, who are commited to the CLR are likely to try to embrace and extend the JVM. What about the web-as-platform and AJAX? Some interesting stuff is happening here too. With the inclusion of Canvas and SVG in the new Firefox (and Gecko), this becomes an interesting component to build graphical applications. So we could see Gecko as a common between both web based applications and for stand-alone desktop applications. Although maybe the distinction will much dissolve. Maybe there's a whole potential zoo of cool available in a Python-Parrot-Gecko hybrid as a rival to Java-JVM-Swing. Yahoo! just enabled every blog and news service in the world to update 200 million American mobile consumers instantly. Every feed, from any source online is now a potential mobile alert service, instantly notifying readers, customers and users of any updates, 24 hours a day, 7 days a week anywhere they happen to be. I prefer to call them Greenspun category 4 models. Damn, I wanted to post a comment to Jeremy telling him about my previous post. But it looks like my ISP is on some blacklist. That's the second time my attempt to post or edit something has fallen foul of these people. I'm pissed, but having closed my own wiki due to spam, I have a bit of sympathy. Hope this doesn't become widespread though or I'll be voiceless. Started? Geeking with Greg: Can Web 2.0 mashups be startups? I think you're [Greg] sort of right - in the literal sense. But may be missing the bigger picture. A lot of web-services are built on (and dependent on) somebody else's web thing. Search engines are a classic example : "how could THAT work? How can Google trust that people won't delete or change the contents of their pages that Google went to so much trouble to index? Isn't the value in the pages themselves, not something as ephemeral as links?" In the real economy, an awful lot of people act as brokers or middle-men between two sources of value, and they DO (apparently) add yet more. Mashups certainly add value that doesn't exist in either of the original sites. The only question is a) whether there's a business model, and b) whether the mashup is unethically parasitic. A lot of mashups have no business model and are done for fun. But that doesn't mean that there can't be something mashup-like that became a huge business. Now Greg thinks Web 2.0 is mashups. Once you start thinking in terms of platforms, then mashups are just applications. We're in the realms of the architecture of participation. Note 1 : I guess tagsonomy means you don't have to give a perfect reference to one individual. A trustworthy way of finding eg. pictures usually of "this type" is OK. In tech. terms. Conversations are interoperability. Which can procede without pairwise co-ordination, and where ideally the intelligence is at the edges. In conversations, you have to listen. Everyone who thinks about building a platform emphasizes the rights of the stakeholders : the application builders and the users. If you don't listen, application builders and users don't talk to you. OK, that's not very coherent. But it's a start. More refinements of this discussion to come. Paul Graham starts off like he doesn't really get the whole thing. Ajax, democracy, and not dissing users. What do they all have in common? I didn't realize they had anything in common till recently, which is one of the reasons I disliked the term "Web 2.0" so much. It seemed that it was being used as a label for whatever happened to be new-- that it didn't predict anything. But there is a common thread. Web 2.0 means using the web the way it's meant to be used. The "trends" we're seeing now are simply the inherent nature of the web emerging from under the broken models that got imposed on it during the Bubble. Richard MacManus made a good point. Google can't embrace syndication because they're so heavily dependent on advertising on web-pages. They'll experiment with ads in feeds, but this is unpopular. In this sense, RSS is disruptive to Google. It's a technology which their business model won't let them get into. 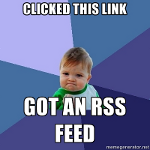 Update A pedant writes : "how is RSS a challange to Google's own business which is search?" Answer : Well, there are several RSS-like search competitors. Things like Technorati have been searching blogs and feeds for ages. Google was slow into blog-search. Or here's a recent idea OPML Sampling, which essentially runs a popularity-based (PageRank-like, though courtesy of Yahoo) search within a set of feeds (defined by an OPML file). New searches, not made by Google, because Google doesn't want to engage with something they haven't yet figured out how to sell ads on? Don Park suggests MS gets out of the browser-space. I like this suggestion. It's not necessarily sensible. But it is bold. I wonder what would happen.